Mamiya Korvette (aka Family) – John's Cameras. This is a heavy fixed lens SLR from Japan. It has a leaf shutter in the lens rather than the focal plane shutter most SLR cameras have. This uses the same system as used by Zeiss Ikon with their Contaflex cameras and Voigtlander with their Bessamatic cameras. In the case of the German cameras, they used complex shutter mechanisms from Compur and Prontor which had leaf shutters in the lens and a secondary shutter in the body. (This system was also used by Hasselblad, Mamiya and Bronica in their medium format cameras). This Mamiya Korvette uses a Copal shutter which works in essentially the same way as Compur and Prontor reflex shutters. As with the Contaflex cameras, the lens is fixed. Later Contaflex cameras had a replaceable front element to the lens was allowed a small variation in focal length. The Bessamatics (And Kodak Retinaflexes) have a removable lens in front of the shutter which should have allowed greater flexibility in lenses but doesn’t seem to have done so in practice. flash: PC socket, no shoe. 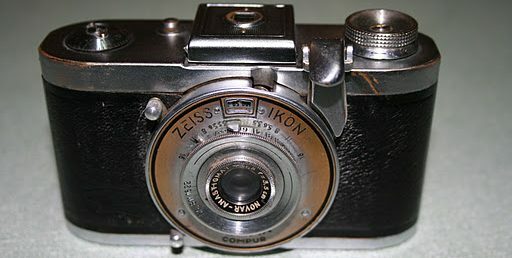 The additional shutter mechanism makes the camera heavy and the action is relatively slow and clunky – but a deal better than the German equivalents. As with most leaf shutter cameras, all the adjustments are by way of rings on the shutter/lens barrel. The inner most ring is the aperture ring. This offers apertures from f/2.8 to f/22 – a very usable range. The aperture numbers are coloured – these colours are repeated as dots by the distance scale to indicate depth of field. The next ring out is the shutter speed ring. I find this very difficult to use as it is right against the aperture ring, is exactly the same diameter as the aperture ring and has the same milled grip. This makes it impossible to determine which ring you are turning By feel and it is hard to move the (stiffish) speed ring without moving the aperture ring at the same time. Speeds available are 1/15 to 1/250 seconds. The outermost ring is the focus ring. This has a very heavily milled grip. The scale is in both feet and metres. Closest focus is 1 m or 3 feet. To use the depth of field scale, you focus the lens and set aperture. Each aperture is printed in a different colour, so you check the coloured dot that is in the same colour as your set aperture – there is a dot on either side of the distance index mark. The distances beside the dots give the range of distances that will be in focus. An example: you set the aperture of f/8 – printed in green – and focus on 5 metres. The left hand green dot is that about 2.5 m and the right-hand green dot is at infinity. This means that everything from 2.5 m to infinity will be in focus. A technical point: for this lens, the hyperfocal distance at f/8 is five metres. The lens is the Mamiya Sekor of 48 mm focal length. This lens is coated to avoid flare. The shutter is made by Copal. A nice addition to the shutter mechanism is a small lever on the right-hand side of the shutter which allows you to close the aperture manually to visually check the depth of field. Doing this while looking into the lens reveals a weak point. The aperture diaphragm consists of only two blades which gives a diamond shaped aperture. Worse, at larger aperture, the aperture is not symmetrical and is offset to one side. This will have implications for bokeh and probably for image quality. Above the lens/shutter is the light meter sensor. This has a small, black, plastic sunshade which will help to improve the light readings in sunny weather. Unfortunately, this is glued to the metal of the top plate andon my camera has become unglued. The right hand side of the top plate is normal for a viewfinder camera. Most SLR cameras have the speed selector here but not with the Korvette(nor Contaflex nor Bessamatic nor Olympus OM1). On the left of the top plate is the light meter read out and controls. It is very reminiscent of the light meter on my Yashica Minister D. ASA (ISO) can be set from 8 to 400 ASA (No DIN setting). You can treat this as either an aperture priority meter or a shutter priority meter. To use as an aperture priority meter– align your required f/stop with the red meter needle and read the shutter speed off in the window in the black part. Conversely, to use as a shutter priority meter, set your required shutter speed in the window and read off the required aperture against the meter needle. The back is plain –there is only the viewfinder eyepiece. While this is nice and large, the focus screen is a Fresnel lens screen with a central ground-glass spot to focus on. No microprisms or split image focusing aids. The left hand end of the top plate has a small screw-in plug which is used to mount accessories, particularly a flashgun. There is no accessory/flash shoe on the pentaprism hump. There is a standard PC socket for the flash on the front of the camera. Inside is the most obvious difference to most SLR cameras. There is no focal plane shutter and there is a secondary shutter at an angle blocking off the lens (see photograph above). When you take a photograph, the leaf shutter in the lens has to close, this secondary shutter has to open, the mirror move out of the way, the leaf shutter has to open and close to expose the film, the secondary shutter has to close again, the mirror must return and the leaf shutter open again. A very complicated sequence! On my camwra, this is very sluggish but this is mostly down to the camera not having been used for a long time. My dry-firing the shutter a great many times is improving it. If the shutter becomes reliable, I shall risk a test film but not with then shutter as it is.